On December 26, 2018, State Councilor and Foreign Minister Wang Yi attended the 2018 National Meeting of Director Generals of Local Foreign Affairs Offices in Hefei of Anhui Province and delivered remarks. The meeting was chaired by Secretary of the Anhui Provincial Committee of the Communist Party of China (CPC) Li Jinbin. Taking Xi Jinping Thought on Socialism with Chinese Characteristics for a New Era as the guidance and through the study and implementation of the spirit of the important speech made by General Secretary Xi Jinping at the conference celebrating the 40th anniversary of China's reform and opening up, Wang Yi analyzed the profound changes unseen in a century and new changes and new characteristics of the international situation in an in-depth way. Wang Yi also elaborated on deeply understanding the historical stage of China's development, gaining a full grasp of the new connotations of an important period of strategic opportunities for China's development and further carrying out the work of major-country diplomacy with Chinese characteristics in the new era. Wang Yi stressed that in the conduct of diplomacy and foreign affairs, we should earnestly implement Xi Jinping Thought on Diplomacy; become deeply conscious of the need to maintain political integrity, think in big-picture terms, follow the leadership core, as well as keep in alignment; strengthen confidence in the path, theory, system, and culture; and uphold Xi Jinping's position as the core of the CPC Central Committee and the whole Party, as well as the authority of the CPC Central Committee and its centralized and unified leadership, in a bid to make new accomplishments and take new responsibilities. In 2019, we should create a sound and stable external environment to celebrate the 70th anniversary of the founding of the People's Republic of China. Wang Yi required that in the conduct of local foreign affairs work in the new era, we should deeply implement the spirit of the Central Conference on Work Relating to Foreign Affairs; take the political stance from a higher view and strengthen the CPC Central Committee's centralized and unified leadership on foreign affairs work; carry out the requirement of strengthening Party discipline in an all-round way and better manage the official trips abroad; and give full play to advantages of local resources and spare no effort in serving the overall national diplomacy and high-quality development, so as to take on a new look and break new ground. 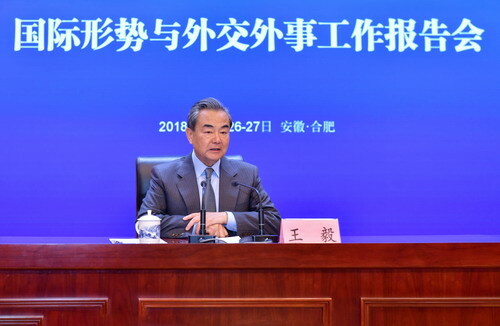 Wang Yi also announced the six concrete things of the Foreign Ministry to support local foreign affairs work in 2019. 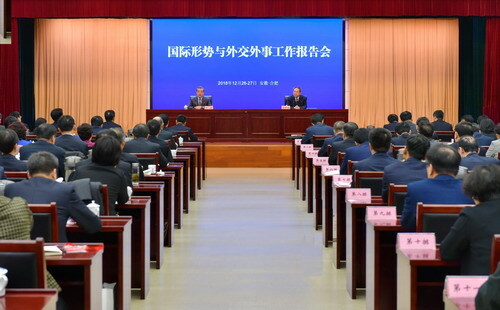 Over 200 people attended the meeting, including Deputy Secretary of the CPC Anhui Provincial Committee and Governor of the People's Government of Anhui Province Li Guoying, members of the theoretical study center group of the CPC Anhui Provincial Committee, Assistant Foreign Minister Zhang Hanhui, Director Generals of Local Foreign Affairs Offices of various provinces, autonomous regions, municipalities, the Xinjiang Production and Construction Corps and sub-provincial cities, leaders of some prefecture-level cities, and relevant principals of the Office of Foreign Affairs of the CPC Central Committee, the Foreign Ministry, the Chinese People's Association for Friendship with Foreign Countries and the Chinese People's Institute of Foreign Affairs.